Neuroscientific research has proven the power of music, even on memory-impaired minds, and a special project aims to make the most of that extraordinary connection. Most people have a hard time picking their all-time favorite song. It’s much easier for them to provide a list of their favorites, which likely would include songs from their youth—music conveying excitement, love, and a life free of most adult responsibilities. Songs from adolescence and young adulthood seem to make people smile and draw them closer to precious memories and their associated emotions. With today’s technology, people can carry these favorite songs wherever they go. Music & Memory, a nonprofit organization dedicated to improving the quality of life for nursing home residents by mainstreaming and promoting the use of personalized digital music, hopes the enjoyment of this technology extends far beyond a music playlist. 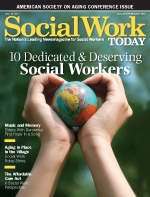 In 2006, Dan Cohen, MSW, a New York City social worker with a community organizing background, was providing support and consultation to several nursing homes. One day while commuting, he was listening to a radio program about the proliferation of iPods. The program motivated him to consider introducing iPods to some of his clients in the nursing homes. Reflecting on the daily experience of many nursing home residents, especially those with dementia, he recognized they rarely have privacy or enjoy individual activities during the course of their day. Nursing home activities routinely are performed with a group. This presents particular difficulty for residents with dementia who become more socially isolated as their disease progresses. Taking this into consideration, Cohen loaded an iPod with a resident’s favorite music before introducing it. Though some staff suggested that listening to an iPod would lead to further isolation, the opposite happened. The iPod experience led to residents’ increased socialization, broad cooperation, and even verbalization. Nursing home staff commented that the music seemed to transport some residents to a happier place, and residents with chronic pain seemed to forget their discomfort when listening to the music. Staff consistently observed and documented that listening to personalized music on an iPod led to reduced agitation, improved behavior, and elevated mood for the residents. Additionally, family members and nursing home staff were encouraged by these dramatic changes. Heartened by this success, Cohen established Music & Memory. “No one experiences music just as sound,” explains Concetta M. Tomaino, DA, MT-BC, LCAT, a pioneer in the field of music therapy. “The various elements of music are processed in the prefrontal cortex of the brain, and we have found that emotional memories, such as love and affection, are very often well preserved for patients with Alzheimer’s disease. “Although we are not yet able to say why conclusively, the songs that carry these strong emotional memories for the patient with Alzheimer’s are the best retained. This results in a patient who can sing along with song lyrics but can’t recognize a formerly familiar face,” adds Tomaino, founder and director of The Institute for Music and Neurologic Function in the Bronx, New York, and vice president of music therapy at Center of Light Health System, one of the largest long term care providers in the state of New York. She has researched music’s relationship with the brain for more than 30 years, and her work has demonstrated how music can assist people with dementia, Parkinson’s disease, and brain damage, confirming that people with dementia, even when they can’t communicate verbally, can respond dramatically to music. Research is under way to better understand this music-memory link. Petr Janata, PhD, a cognitive neuroscientist at the University of California, Davis, has studied the medial prefrontal cortex as a brain region for music processing and memories. His work has shown activity increases in this part of the brain when playing music linked to a person’s memories. The fact that the prefrontal cortex is among the last of the brain regions to atrophy may explain the ability of patients with Alzheimer’s who have severe memory loss to remember songs from their distant past (Hsu, 2009). Looking at another aspect of music and memory, Brandon Ally, PhD, an assistant professor of neurology at Boston University, found that patients with Alzheimer’s learned more lyrics when they were set to music rather than spoken. But healthy elder individuals remembered just as much and just as well with or without music (Seligson, 2010). There could be numerous practical applications of this research. For example, medication compliance regimens are always a crucial issue for patients with Alzheimer’s. Could compliance be improved if the dosing and schedule were presented as a jingle or song or given some other type of musical association (Cheung, 2010)? In one video posted on the Music & Memory website, Oliver Sacks, MD, honorary medical advisor at The Institute for Music and Neurologic Function and a professor of neurology and psychiatry at Columbia Unviversity, states, “The past which is not recoverable in any other way seems to be sort of ‘embedded in amber,’ if you will, in music. Having severe dementia means one can remember very little of one’s past. But one will always remember familiar songs that one has listened to and sung. Tomaino has demonstrated how music can facilitate the return of some brain functions a person has lost. She has worked with people with neurological conditions who have experienced some revival of the timing mechanisms, word-finding ability, recognition memory, and even short-term memory functions that have been lost. She believes music is an enriched sensory stimulus that allows for the disinhibition of some of the brain’s inhibited functions. This means that a person may not have access to these brain functions independently, but the proper application of music can allow for some restoration. The Institute for Music and Neurologic Function is collaborating with Music & Memory to implement best practice personalized music activity. This collaboration, called Well Tuned: Music Players for Heath, features specially developed music programs that healthcare providers can deliver to their patients using iPods and other mp3 players. It provides people who are living with conditions such as Alzheimer’s disease and other dementias as well as depression and anxiety the opportunity to connect to the music they love, improve their overall health, and improve their mood. Cobble Hill Health Center in Brooklyn, New York, has enjoyed tremendous success with this personalized music program. In 2008, Cohen met with the home’s leadership and interdisciplinary teams from the various units. An individual personalized music policy was established; the staff was trained in the use of an iPod; and a music library was created using iTunes and CDs provided by family members. There are now more than 100 Cobble Hill residents using iPods, helping them to feel connected to their memories, their lives, and each other. A documentary called Alive Inside, a film about Music & Memory scheduled for general release this summer, details Cohen’s journey to improve the lives of patients with dementia through personalized music and captures the awakening that some people experience when they listen to their favorite music from the past. When a brief video segment from the documentary featuring a Cobble Hill resident named Henry reacting to music on his iPod was posted on the Internet, it went viral with more than 6 million views in four days. It also was tremendously successful at raising the profile of Music & Memory. Watching Henry come to life in this video is astonishing and deeply moving. Although he initially appears withdrawn and unresponsive (he is unable to recognize his daughter), with the introduction of his personalized music he brightens and becomes animated. He moves his arms and feet as if he is dancing within the confines of his wheelchair. He remembers his favorite musician and sings the lyrics of a famous Christmas song, adding his own improvised crooning. He talks about the music and can share how he feels about it in a remarkably colorful and understandable way. The video also provides a glimpse into personalized music’s impact on nursing home staff. Alternating tears and laughter, one staff member expresses how moved and joyful she feels at the tremendous changes she observes in residents. It is as if the hopelessness so often assumed with dementia is no longer an absolute principle. Still more can be done with iPods and personalized music. More client populations should have the opportunity to use the technology. For example, some nursing homes are improving the quality of life for ventilator patients with the use of personalized music. Also, personalized iPods are being introduced in hospice programs to contribute to these patients’ comfort. Could personalized music with iPods in some cases be a realistic alternative to the use of antipsychotic medications? Sung and Chang (2005) performed an extensive review of studies conducted from 1993 to 2005 on preferred music’s effects on agitated behaviors in older people with dementia. Although they caution that further research is needed, they did conclude that preferred music interventions demonstrated positive outcomes in reducing some agitated behaviors in older dementia patients. This could be helpful in following guidelines that the Centers for Medicare & Medicaid Services is establishing to decrease the use of antipsychotic medications in nursing homes throughout the United States. Ann Wyatt, MSW, a culture change consultant who serves on Music & Memory’s board of directors, sees iPods and similar technology as an enormous opportunity for nursing home residents. “This technology is providing nursing home residents with access and the ability to interact with the wider world in a way we never thought possible,” she notes. The optimism and hopefulness that Wyatt expresses is probably the most common response when people witness the transformation that personalized music can produce, but it would be wrong to suggest that all nursing home administrators and staff are immediately enthused when they learn about personalized music. “Because of the financial stresses on long term care organizations and their inherent resistance to change, it’s the exceptional nursing home that will embrace new approaches to improving resident quality of life,” Cohen explains. He also points out that once a home decides to introduce the iPods, the benefits usually are realized quickly, including residents who are happier and more social; deepened relationship among staff, family members, and residents; the creation of a calmer, more supportive social environment; and less staff time spent dealing with behavior management issues. Unfortunately, there is a shortage of iPods at Music & Memory, preventing the project’s institution at nursing homes eager to get started. Donations of old iPods are welcome and can be sent to Music & Memory Donations, 160 First Street, P.O. Box 590, Mineola, NY 11501. More information also is available at www.musicandmemory.org. Cheung, R. (2010). Music and memory. Retrieved from http://www.pbs.org/wgbh/nova/body/alzheimers-music-au.html. Hsu, J. (2009). Music-memory connection found in brain. Retrieved from http://www.livescience.com/5327-music-memory-connection-brain.html. Seligson, S. (2010). Music boosts memory in Alzheimer’s. Retrieved from http://www.bu.edu/today/2010/music-boosts-memory-in-alzheimer’s/. Sung, H. C., & Chang, A. M. (2005). Use of preferred music to decrease agitated behaviours in older people with dementia: a review of the literature. Journal of Clinical Nursing, 14(9), 1133-1140.